Cannon Beach Vacation Rentals made our stay in Cannon Beach one to remember. The property was amazing and advertised very well. All our needs were met and our expectations exceeded! This was our first time visiting Cannon Beach however definitely won't be our last. Thanks you for everything. Over all, it was excellent. My only negative comment is that I found the lease agreement unduly landlord friendly with a few provisions unnecessary. It was very professional and we loved the home. As we first drove up the driveway we were greeted by a family in residence that we came to consider our pets and protectors....we will never forget that! I will try to send photos. Cannon Beach Vacation Rentals are outstanding, they take care of all of your needs. Excellent service and property management - wonderful beachfront property! We needed the chance to disconnect from work and really relax, and this is one of the few places we can go to do that. Great property management company. Honest, helpful, communicates well and goes above and beyond. House felt just like home and we were all sad to leave. Great house for a big group. There was lots of room to spread out. Rooms were all comfortable and the house is very clean. The kitchen has everything you need including a blender, slow cooker. The only thing that didn't work was the grill outside and the guys spent a few hours repairing and making it work so hopefully the grill is replaced. It was rusty, leaking gas and didn't hold the heat very well. A bit on the pricier side but for good reason. You get what you pay for in space and amenities. 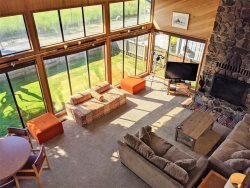 The house is located walking distance to a beach access, the town center and about 1.5 miles drive to Ecola State Park for hiking and view points including Indian Beach. Highly recommend this house for big families or a large group of friends. Only good things to say about this place. Has a perfect view of Haystack Rock to wake up to every morning. The rental management company was also very easy to work with (my 3rd time coming back to one of their rentals). They are kind, polite and very accommodating. Highly recommend Cannon Beach Vacation Rentals! I left my wedding band in the house and realized it only hours later when I got home and they were so helpful making sure it got back to me safely. Now that's great, honest customer service! Another great experience. We had trouble with a faulty fuse, but it was taken care of quickly and caused no problems. Friendliness of staff is exemplary. We were looking for a home that would hold three families that allowed private space (and bathrooms) but had plenty of common areas that was also oceanfront. After just the first few hours, no one wanted to ever leave! We all agreed we need to come back as often as it was available. wonderful value and accommodations! such a cute little property! love the mugs and coffee gift at check in! As usual our stay in Rustlewood was fantastic. I think this is our 4th or 5th stay there. If there are any off-season specials, house exchanges, etc. related to the Rustlewood, please contact us. We have a huge Southwest-style home in the mtns. outside of Albuquerque. We've done house-exchanges before. Anyway, we can't say enough wonderful things about the Rustlewood. We love to come during the rainy, foggy and cold times of the year. We've talked to locals we've met along the beach that have told us stories of the Conway-Browns and learned and read about their life in the book and pictures on the wall. We feel that we are a tiny bit of the history of Arch Cape. The place has the wonderful creakiness, smell, atmosphere, and sense of fun that a "cabin" should have. If we won the lottery we would buy it in a NY second. Thank you!!! The staff when we checked in were very welcoming and helpful, The Loft is beautiful, and Cannon Beach is the best! cannon beach vacation rentals are totally top notch. Our stay was wonderful! more than we had hoped for. what an awesome weekend and a beautiful house!